As proven by science, bunnies love carrots, and in this game… mutants do too. So much that they’re not going to stop until they’ve consumed that giant delicious looking carrot you’ve been tasked with defending, in Of Carrots And Blood. I mean, it has eyes and all, so surely you’re not planning on eating it, right? RIGHT? Vegetables have feelings too. Or something. Anyway, ironically, your basic weapon against the disgusting horde of decaying flesh is actually a carrot. Hardly my weapon of choice, but to each their own, and who knows – maybe this particular bunny’s empowered it with some secret ancient formula? It does annihilate everything in one hit, so maybe? Whatever the case, mutants will be appearing from every side, corner and angle of the screen, so you’re going to need good reflexes and a steady aim to survive. Even more so, since friendly fire is totally a thing, meaning you’ll want to avoid hitting the carrot – the enemy will do that plenty for ya, after all. Every now and then, temporary power-ups will appear in random locations, and you better believe that these will most certainly help even the odds: a massive carrot shield that disintegrates enemies, to a boomerang (which looks like a magnet?) and other groovy weapon replacements. Oh and don’t even get me started on the awesomeness of the rapid-fire power-up. Such massacre potential! That said, you’re not the only one who’s able to ‘evolve’, as you’ll soon be facing enemies with riot shields and… some really creepy shadowy figure. Had I brought a friend along, since the game does support local co-op, maybe that annoying bugger wouldn’t have annihilated me time and time again. Or maybe he would have still. Hard to say, but with another player by my side, I could have been revived at least – provided he/she reached me prior to also biting the dust, of course. As far as twin-stick shooters go, Of Carrots And Blood may be a bit on the simple side; especially for genre veterans. But I’d still say it’s got the goods, with a great art style, groovy music, plenty of fast-paced action, and… did I mention it has two-player co-op? Much too rare these days! 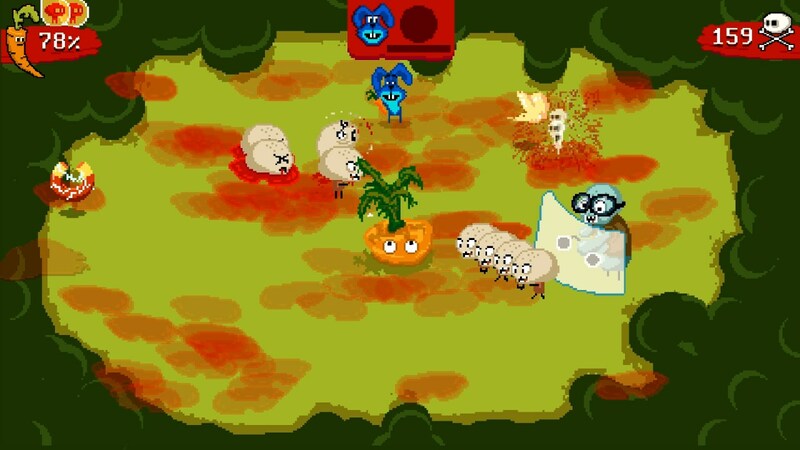 Also, who hasn’t dreamt of taking up the role of a bunny to defend a (supposedly) living, breathing carrot from a mutated horde? To arms, my brethren! Of Carrots And Blood is available DRM-free for Windows and OS X, with Linux “coming soon”, carrying a pay-what-you-want price tag.